EXTENSIVELY UPGRADED ESTATE SALE: this sunny 4-5 BR/2.5 B has been a-buzz with contractors & is now available for your own final touches! 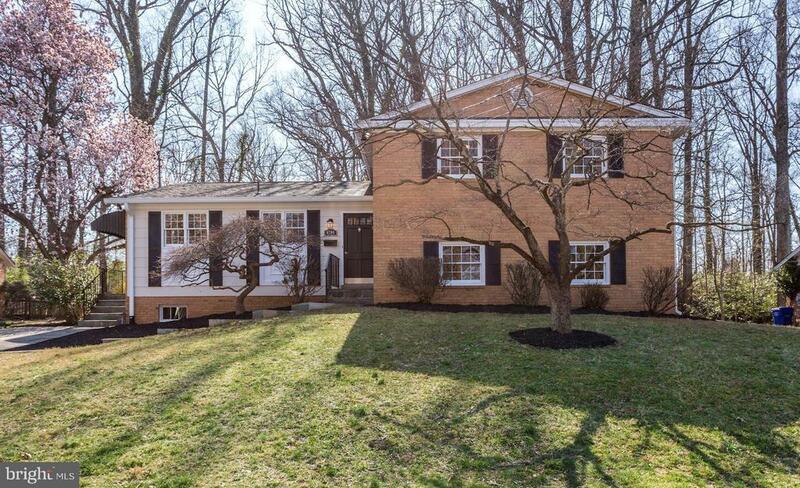 Large model, 4-level split w/ great bones & room to grow on pretty, cherry tree-lined street. Master BR combined with adjacent BR creates charming sitting room w/ tons of closet space; room to expand existing MBA; kitchen w/huge breakfast area & side door to driveway; DR opens onto screen porch; walk-out FR level with fireplace & sliders to patio plus 20 office/legal BR & laundry/storage room; unfinished basement w/side entrance, perfect for future playroom, home offices, or in-law suite! Rear yard backs to woods for lovely views & privacy. BRAND NEW UPGRADES INCLUDE: architectural roof & 6" gutters, upgraded flagstone walkway, freshly painted inside & out, refinished hardwood floors, new ceramic plank foyer floor, new lighting fixtures & electric outlets, refreshed front entry. Check out virtual tour for clickable floor plans. Sold "As Is".